Will Affinity Publisher support colour fonts please? As part of this, will Affinity Publisher when using a colour font, produce a PDF that shows the colours please? It may be that PDF does not support colour fonts as such, but Affinity Publisher could possibly work round this by producing a multi-layer conventional PDF automatically where the text layer is repeated as many times as necessary in order to have one colour in each layer so that the display looks good, though I accept that could be tricky depending upon how colours are ordered for each of the glyphs in the font. For example, if there are, say, blue letters each with green holly leaves and red berries, and each glyph has the colours in the same order that could go down to three layers blue, green, red. Yet if the font has lots of emoji and there are many colours and they are not all in the same order in each glyph that could mean that some colours have to have two layers at different place in the "layer pile" and it could all be very complicated and maybe in practical terms impossible. I think you are making that out to be more complicated than it needs to be. To provide color fonts in a PDF format that does not support them would require converting to curves before producing the PDF. I'm afraid this isn't a priority for us at the moment. The hard part is drawing to the screen, because we have our own text engine. We'd need to write code to discover what colours the font was using. There are several types of color fonts, one of which is basically an OpenType font that replaces individual glyphs with SVG drawings. I would like to think that conceptually, those could be supported by connecting the text engine to the existing code you already use for rendering SVG files? Well, I was not thinking of the SVG drawings, I was thinking of the format using the CPAL and COLR tables of an OpenType colour font. For me, Affinity Publisher should be a first class software program, so that it is not a question of "Well, if you want features like that, you need to get EXPENSIVE PACKAGE that is EVEN MORE EXPENSIVE PACKAGE if bought in the United Kingdom" but that "Well, that Affinity Publisher software from Serif is amazingly modern, even futuristic, notwithstanding its budget price." For example, I have already noticed the feature that all of the Universal Character Set can be accessed as characters (rather than just as glyphs) and that the characters can be extracted from a PDF that has been produced, even that the underlying text can be extracted from a PDF that has been produced where there are ligature glyphs used in the display (subject to the font having suitable glyph names for ligature glyphs so as to facilitate that extractability). For me those are significant advances over PagePlus. So, while I appreciate that things take time, and there is not the thing about priority, I hope that such features are on the agenda. I wonder what is the target market for Affinity Publisher. For example, there was a time when PagePlus seemed, over a few updates, around PPX3 and PPX4, to be focused on printshops, with PPX5 OpenType capability was introduced. I first started using PagePlus with PagePlus 9 because it included the ability to produce PDF documents. PagePlus 12 allowed plane 0 characters to go to PDF as characters rather than convert to curves and PPX5 introduced OpenType facilities. My publishing is as pure electronic publications on the web. The OpenType facilities in PPX5 I found to be great. I was able to use them to test fonts that I had made using the High-Logic FontCreator program. I have found that sometimes it takes quite a while for Serif to introduce a new feature, yet when they do, they do it extremely well. The SVG fonts I'm referring to are also stored in an OpenType font, and doing so has been documented in the OpenType standard, so they are also a form of OpenType color font. From what I am seeing QuarkXPress seems to be about the only major program out there that supports the Micro$oft CPAL/COLR fonts (other than web browsers). SVG color fonts are also a W3C standard, seem to be much more common, and are the only color font format natively supported on both MacOS and Windows, along with iOS. The following discussion about colour font technology might be of interest to some readers. As someone who knows little about the subject, I'm curious what benefits color font support would provide for us? How is it better than simply setting the fill color for text, which we can do today? That’s fine for single colours, Walt, but you might want multiple colours. At the moment we would have to resort to converting to curves and laboriously colouring the individual shapes. You can have multiple colors within the font and within the characters. And because the characters are SVG drawings they can losslessly scale to any size. 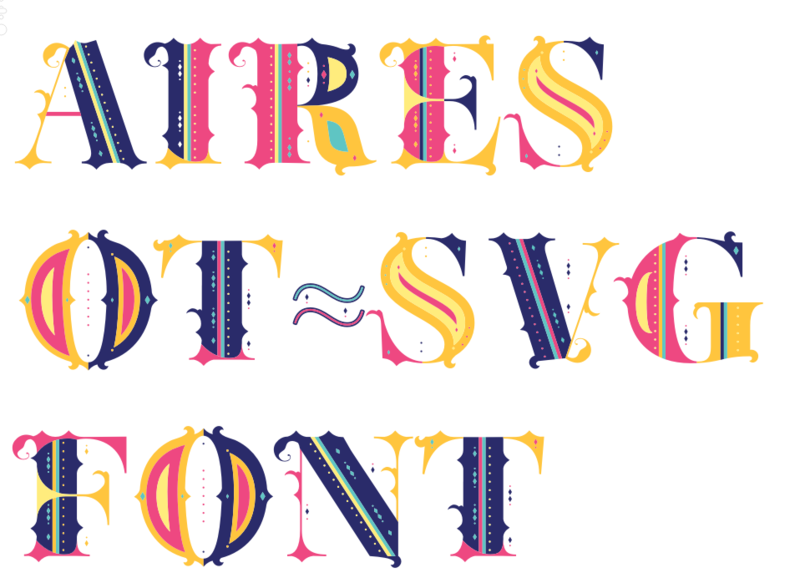 Aires is a free color OpenType-SVG font. The characters are each an editable SVG. Here is the A character open for editing. 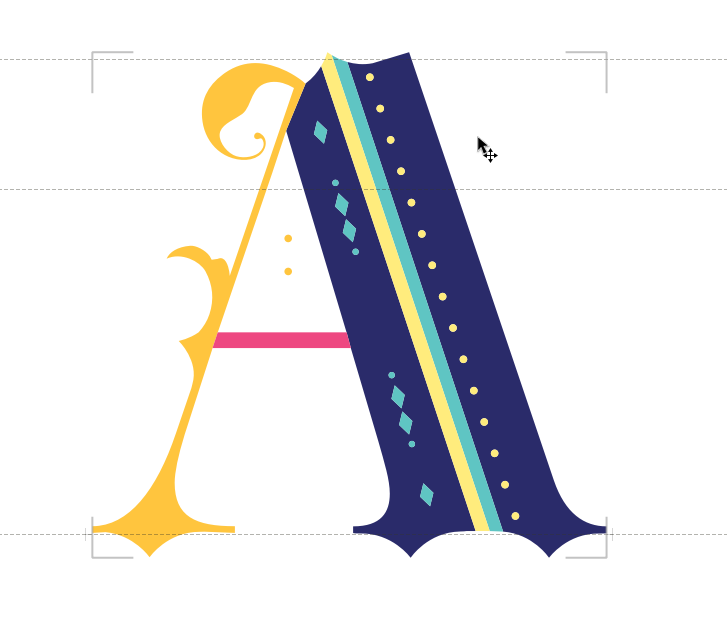 Aires ﻿is a free color OpenType-SVG font. Er. It was free (for personal usage) a few months ago. Most all color fonts I use also have a fallback, plain black version for applications that do not support color fonts. So those can typically be recolored like a non-color font can, be converted to curves and broken apart, recolored, etc. Obviously these are mainly for headers, for use in artwork, etc., not really something you would normally use in the body of a document - for those places where they can be used they can be used to great effect. The five fonts released for #ColorFontWeek are available for purchase. Two of the ‘purchases’ are free; Aires isn’t one of them, but at $10 it’s relatively inexpensive. 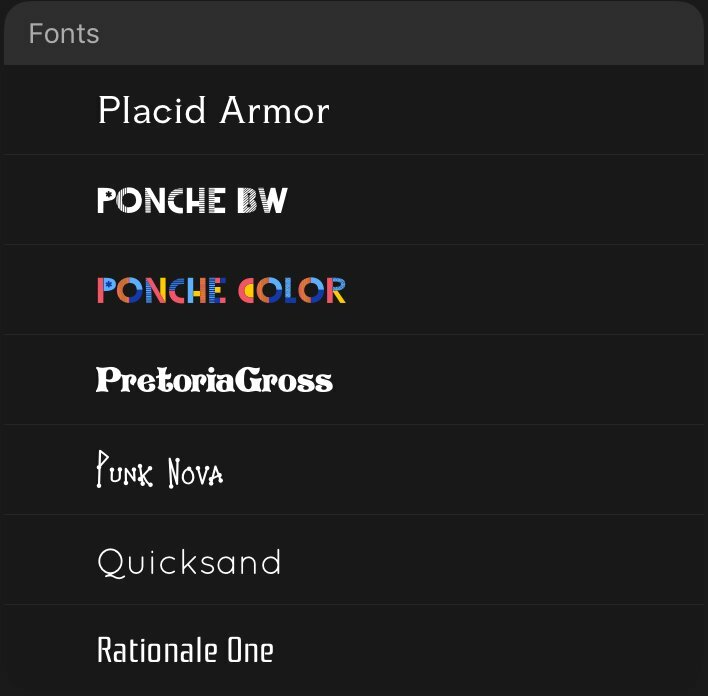 Apparently I got Aires from Fontself during ColorFontWeek (according to the text file included). The file name kinda threw me I guess (Aires-FREE.otf). The included license does allow both personal and commercial use. Anyway, it is a very good example of a color OpenType-SVG font for testing. Do you have anything to use it as intended? If not, beer would be a better thing for the $10. I've got a mix of 200 or so COLR/SVG fonts. A handful I purchased, the rest given for testing purposes. The novelty wore off quickly.